When you think of the Internet of Things, does your mind wander to connected-home gadgets such as smart thermostats that know when you’re home and when you’re away, or refrigerators that can read your recipes and know when you’re getting low on ingredients? IoT is at the center of a truly smart home and all the conveniences that come with it, but the concept’s tent is a whole lot bigger than that. It’s also capable of tackling much bigger challenges, such as air pollution and water shortages. It’s these larger issues that Samsung had in mind when developing Artik, an open platform designed to fast-track a variety of IoT solutions. To get things going, Samsung unveiled three new embedded modules. The first is the Artik 1, an entry-level option that’s smaller than a dime at just 12mm by 12mm. It combines a 250MHz dual-core processor with 4MB of flash memory, Bluetooth/Bluetooth Low Energy connectivity, and a nine-axis sensor. It’s intended for lower-power, small form factor IoT devices. Sitting in the middle is the Artik 5 with a 1GHz dual-core processor, 512MB of RAM, and 4GB of flash memory. It’s a bit larger than the Artik 1 at 29mm by 25mm and will find its way into home hubs, drones, and high-end wearable devices. That leaves the Artik 10, the most advanced module of the bunch with an eight-core processor, 2GB of RAM, 16GB of flash memory, 1080p video encoding and decoding, and 5.1-channel audio support. It also includes Wi-Fi, Bluetooth/BLE, and ZigBee connectivity. Samsung says the Artik 10 is designed for home servers, media applications, and various industrial applications. Why this matters: Samsung sees huge opportunity in IoT solutions, and its Artik initiative has the potential to make the company an obscene amount of money. If the platform works as advertised, developers new to the IoT category will have an easier time taking a concept and forming it into a shipping product, whether that product is aimed at home consumers or solving social challenges. To encourage the latter (and no doubt drum up interest in Artik), Sohn also announced the Samsung Artic Challenge , with a $100,000 top prize for whoever develops the most effective use of IoT and Artic to reduce water consumption. 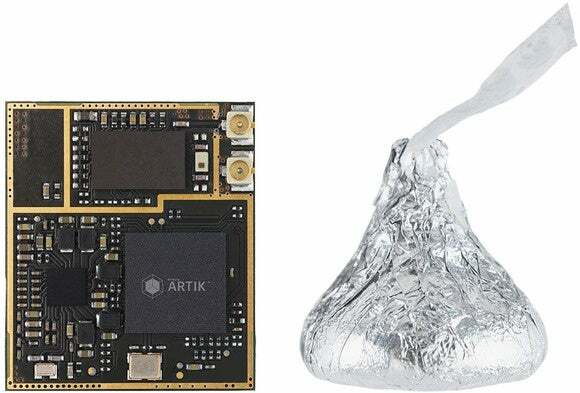 Samsung’s aiming to cover the full spectrum of IoT development with its trio of Artik devices. It’s all part of a larger initiative to accelerate the development of IoT solutions for problems around the world. In addition to providing the open platform for that very purpose, Samsung president and chief strategy officer Young Sohn made some noise at IoT World by calling on the technology industry to step up and leverage the IoT category to address challenges that extend beyond the connected home.